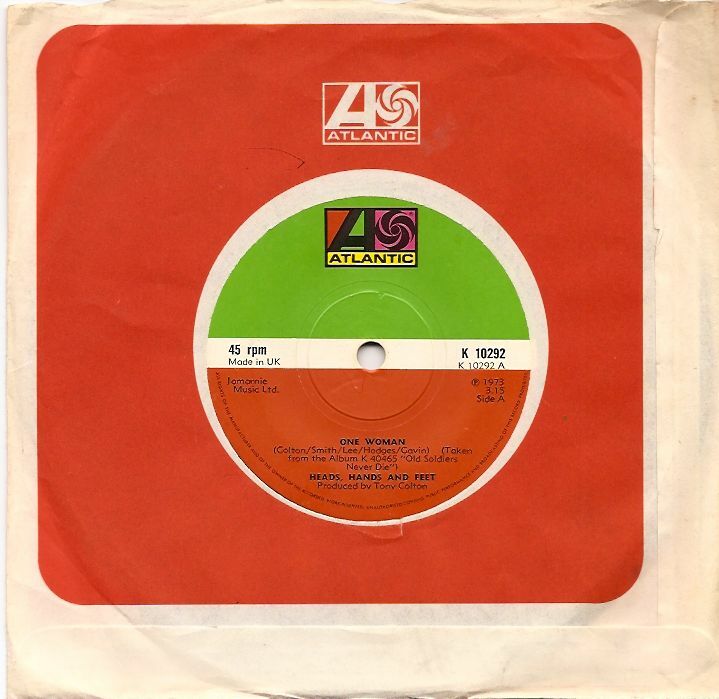 Albums came in rapid succession during the 70′s. The first by Heads, Hands & Feet was a double, and not long after came it’s followup, TRACKS. These were issued on Island UK and Capitol US, during the era when those Capitol labels were that beautiful lime green. I wasn’t paying much attention to the band, they had an intentionally American sound. I was put off. Fast forward to summer ’72. They’re third on the bill to The J. Geils Band and Humble Pie. I was certainly not about to miss Steve Marriott. So, we got there early to see Heads, Hands & Feet. After all, they were English. By now, I was becoming a fan. 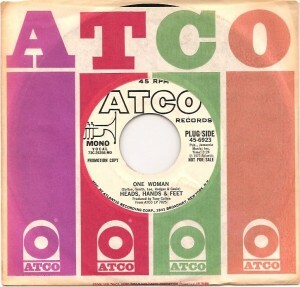 They’d recently switched labels to Atco/Atlantic, and their single ‘One Woman’ was pretty great. I particularly appreciated that lead singer, Tony Colton, doubled as a producer for one of my all time favorite albums: ON THE BOARDS by Taste. Plain and simple, they were tremendous live. I would say they stole the show, certainly preferring them to the headliner by miles. At this point, Peter Frampton had left second-on-the-bill, Humble Pie, but it was sure fun being invited back to the Holiday Inn by Steve Marriott for a party. More on that in some other post. So yes, Heads, Hands & Feet ripped up a storm, and their extended version of ‘One Woman’, the show closer, took the cake. I mean these guys were super great musicians. You can hear it in the recordings. Guitarist Albert Lee has been cited as a bit of a virtuoso over the years, and he certainly was on fire that night. Chas Hodges on bass was equally important to that fire, playing off of Albert Lee almost like a second guitarist. We wormed our way into their crowded dressing room and they seemed somewhat impressed to have a few fans. It was fun complimenting Tony Colton on his work with Taste. I remember him being appreciative, and a bit surprised. All in all, it was obvious they weren’t having a very good time, and I’m pretty sure they called it a day soon afterwards. Too bad.